Boston, MA – Over 50 athletes with disabilities competed amongst the 2,200+ total participants at the 2012 C.R.A.S.H.-B. Sprints, an annual indoor rowing competition that took place earlier today at Boston University’s Agganis Arena. Competitors rowed 1,000 or 2,000 meters against the clock on sponsor Concept2 ergometers in various categories including Men’s and Women’s Open, Lightweight, Under-23, Junior, Master, Veteran and Adaptive divisions. This year’s event marked the highest level of participation by rowers with intellectual disability since the category was added to the program in 2010 with Syd Lea, Bruce Worley, and Mark Worley all setting personal bests and earning Gold, Silver and Bronze respectively. Lea’s time broke the INAS world record in the 1,ooom for para-athletes with intellectual disability by over 8 seconds. Michael Lautenberger placed fourth to round out the men’s field, while Matt McLaughlin won the junior men’s title. In the women’s event, Kristina Gillis returned to win the women’s title for the third year in a row. 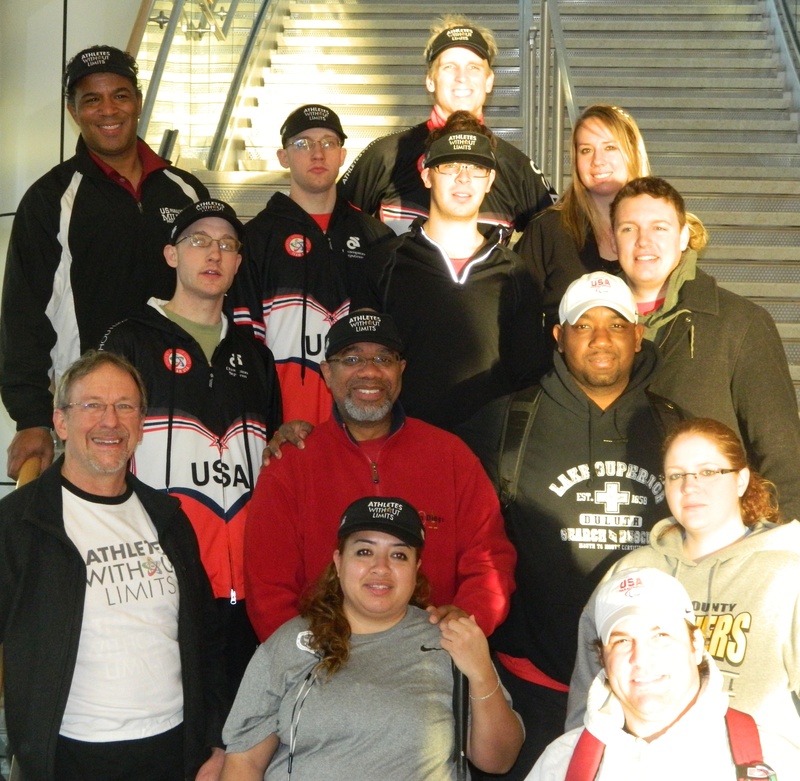 Led by Coach Patrick Johnson, the Athletes Without Limits/US Paralympic Military Program (USPMP) Rowing Team is a “water” breaking integrated crew of high school athletes, athletes with physical disability and athletes with intellectual disability training and racing together. Based out of the Anacostia Community Boathouse in Washington, DC, the team began in 2011 in partnership with DC Strokes Rowing Club’s America Rows diversity and inclusion initiative sponsored by USRowing. “It’s been exciting for Athletes Without Limits to help create new opportunities for adaptive rowers through this partnership,” said President Barry Holman. 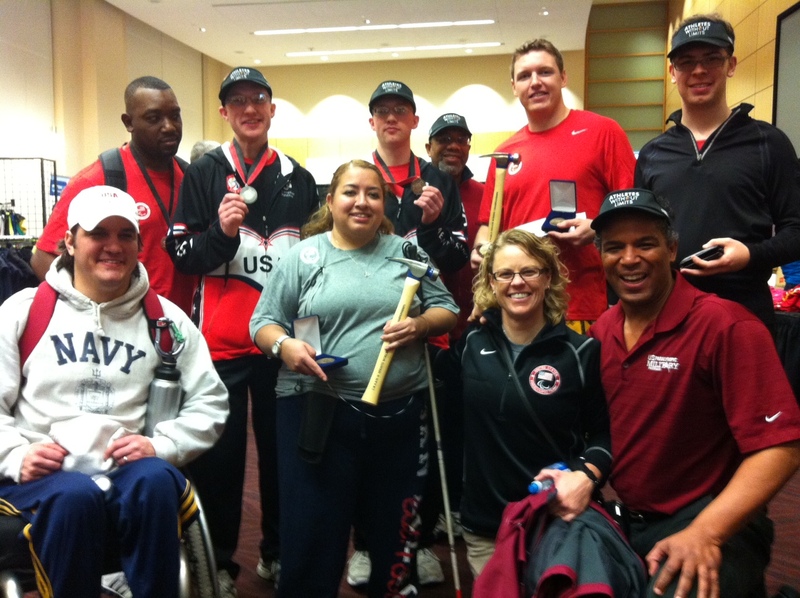 The Athletes Without Limits/USPMP team earned five medals throughout the days events: Claudia Perry won Gold in the Women’s Visually Impaired Division; Paul Hurley won Gold in the Men’s Physically Disabled Legs/Trunk/Arms (LTA) Division; Bruce Worley won Silver in the Men’s Intellectually Disabled Division; Keniel Martinez won Bronze in the Men’s Physically Disabled Trunk and Arms Divisions; Craig Clark won Bronze in the Men’s Physically Disabled LTA Division; Mark Worley won Bronze in the Men’s Intellectually Disabled Division; while Dan Ahr placed fourth in the Men’s Physically Disabled Arms/Shoulders Division; and Michael Lautenberger placed fourth in the Men’s Intellectually Disabled Division. Results and photos are posted at www.concept2.com/us/racing/crashb and www.crash-b.org, which describes the event as originating in 1982 when a group of Boston rowers, many of whom were members of the US National and Olympic Rowing teams training out of Harvard University, named themselves the “Charles River All-Star Has-Beens” and organized the first indoor meet of its kind. The event now draws over 7,000 spectators, an ideal opportunity to create awareness of the high level at which athletes with intellectual, physical or visual disabilities are able to perform. Part of this momentum comes from a new Paralympic rowing class for athletes with intellectual disability (already part of some events like C.R.A.S.H.-B.) likely to be incorporated into the 2016 Paralympic Games in Rio de Janeiro. To learn more about adaptive rowing opportunities, including those for athletes with intellectual disability please visit www.athleteswithoutlimits.org/sports/rowing. Athletes Without Limits is actively seeking corporate sponsors to help us make history by developing athletes with intellectual disability to compete in mainstream regattas and the new ID class at the 2016 Paralympics. Please contact us via our Sponsor Inquiry Form. Contact Athletes Without Limits from http://www.athleteswithoutlimits.org/about/contact. Athletes Without Limits is a nonprofit dedicated to helping athletes with intellectual disability integrate and accelerate in mainstream sport. As the US Member of INAS (The International Federation for Athletes with Intellectual Disability), Athletes Without Limits organizes US Teams of athletes competing cycling, rowing, swimming, skiing, track & field, table tennis and other sports at high level international competition, and oversees the US eligibility process for new Paralympic classes for intellectual disability.